For the last 12 years, Moondance Jam has attracted some of the biggest names in classic rock. .38 Special, Alice Cooper, The Beach Boys, Boston, Cinderella, Cheap Trick, Creedence Clearwater Revisited, John Fogerty, Journey, Lynyrd Skynyrd, Peter Frampton, Poison, REO Speedwagon, Ted Nugent, Tesla, Twisted Sister and ZZ Top are just some of the bands who have taken the stage in front of 20,000-plus crowds. Those responsible for taking Moondance Jam from a regional band festival to the biggest outdoor rock 'n' roll concert are Jack Jordan and Jack Thibault of T.E.A. Productions. T.E.A. Productions works very closely with Bill Bieloh to sign the bands who perform at Moondance. "For me, it's the best festival we put on," said Jordan. "Every year the people who work make it that way." The process of looking at bands for the upcoming Jam begins in September. Jordan and Thibault meet and try and get ideas from Bieloh about who he and his wife Kathy would like to see and also to review the acts who are touring. "We try match up these acts to other events we have going on," Jordan noted. "We start the buying process, the bidding in December. Most of the time the major classic rock bands don't decide until after the first of the year about their summer tours." 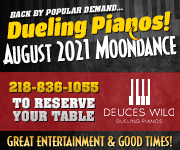 Jordan, who said he and Thibault promoted more than 250 events last year, believes Moondance is one of if not the best run classic rock festivals in the United States. Not everything goes without a hitch. The last two years there have been problems as replacement bands had to be signed. In 2005, The Doors of the 21st Century were forced to cancel after legal problems arose with a former band member. Twisted Sister was signed and put on a great show. This year, Elliot Easton of The New Cars was injured in a traffic accident and could not continue on tour, and the band had to cancel. Poison, who T.E.A. has promoted before, said they were available and wanted to play Moondance, even though it was their scheduled day off. "We felt it would be a home run, not only for ticket sales, but increasing the demographics of our market," Jordan said. "Talking with Bret [Michaels] after the show, he said it was one of the neatest events they played, and they would love to come back." 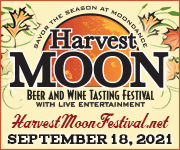 Stage Director Mark Kirchhoff agrees that the Moondance lineup just gets better and better each year. He said his first concert he ever went too was Alice Cooper back in 1974. "To see him a couple of years ago here and then to have him come back again is neat," he said. "You have all your childhood heroes, the music you grew up with. And then you have a chance to listen to them live and, in some cases [to] actually meet the people; it's exciting." 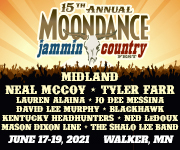 Jordan, who like Bieloh has a pulse on what Jammers would like to see, talked about Tom Petty, John Cougar, ZZ Top and others for Moondance Jam Sweet 16, scheduled for July 11-14.